I started the fast on a bit of a whim. It ended most purposefully with an apple and a big spoon of peanut butter. It was not as good as I had been imagining all week, but I looked down at my stomach and asked it, “Are you happy now?” It gurgled, thank you, back at me. Media has way too many pictures of food. There are the obvious commercials for the -gotta have it now- fast food and sugary treats. Pinterest can be evil. My DVR has a list of cooking competition shows waiting for me. I had never noticed how much regular TV shows flash food across the screen. I envied Homer Simpson’s plate. Really, craving cartoon food! Sleeping is a good way to avoid night-time cravings. 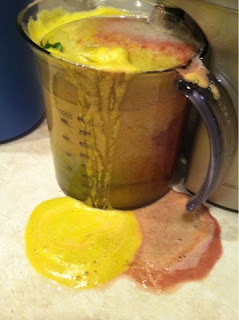 Wheat grass powder does not add a lot of taste….until two hours later. People are not sure if you are committed or should be committed. When I shared my fast story with those around me, I received a variety of responses but most were curious to learn more about it. Maybe it was the car wreck effect, but people were interested. It was amazing how many have been adjusting their diets and investigating the path to health through better food. There are even a couple of people who have started using juice to add to their nutrition regime (converts 😉 ). My gut is very musically gifted. Sometimes nothing is better than another juice. Juice, like anything, gets old when it is the only option. The smoothies did keep me sane. Hunger can increase anxiety and decrease focus. I was getting a lot of nutrients but was still hungry. School food programs for hungry kids should be supported!!! I now have another tool in the health toolbox. I dropped 9 pounds. Most of it was water, but obviously, unwanted, extra water. I have given my digestive track a break. A chance to recover from an over indulgence in gluten and lactose containing food. This entry was posted in Health, Life and tagged cartoon food, Celiac, Diet, fasting, food, food sensitivity, Gluten, health, Juice, Juice fast, juicer, lifestyle, media, men's health, nutrition, organic, Pinterest, sleeping, TV, vegetarian, wheat grass powder, women's health. Bookmark the permalink. Oops. Today, I tried to keep it light in general but could not bare to juice. My plan, for the moment, is to avoid dairy and gluten. They, together with salt, seem to make me feel the worst. I will Try to have at least one juice a day and stick with unprocessed foods as much as possible. Fruits, veg, and some ‘green’ meats ( mainly chicken and fish). I have stuff to make chicken and veg soup for lunch this week. I did have some coconut milk based ice cream today :). Judging by the gurgles, I will not buy any more for awhile. Good for you and congrats for making it through. I’ve never done a fast/cleanse, but am slightly intruiged. Let it simmer in the back of your mind long enough and one day you may wake up in juicing state of mind 8). Chewing is so much work. Too funny, especially the musical stomach. I live off Arizona Tea’s Green Tea with honey and ginseng. After too much, I have to drink something else. Great work on the 9 pounds. Thanks for coming by. That sounds like a great tea! We all need to stay the bleep away from gluten and lactose. I don’t but know I should. Number 8 is so true. I was fasting yesterday and it was really difficult to concentrate!